That is exactly how we feel every time we climb a mountain. We attempt to reach summits to help us remember how human we are. We climb mountains so that we can meet ourselves, seek answers about why we exist in the first place, how we are connected to the world, and commune with Mother Nature. One such mountain that could eloquently teach us about these things is the mighty and majestic Mt. Kanlaon in Negros, an active stratovolcano straddled between the provinces of Negros Oriental and Negros Occidental in Negros Island, Philippines. 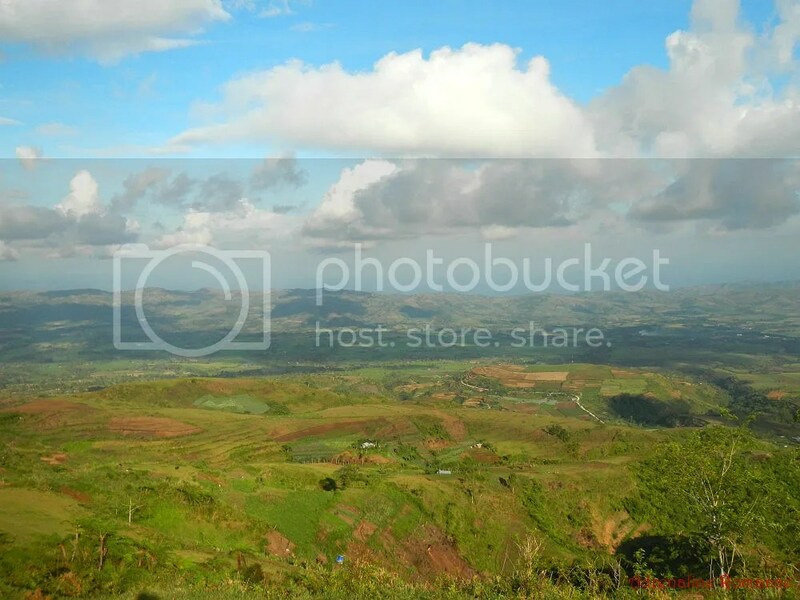 It is considered an ultra-prominent peak and can be seen as a conspicuous feature of Negros from a large part of Western Cebu. 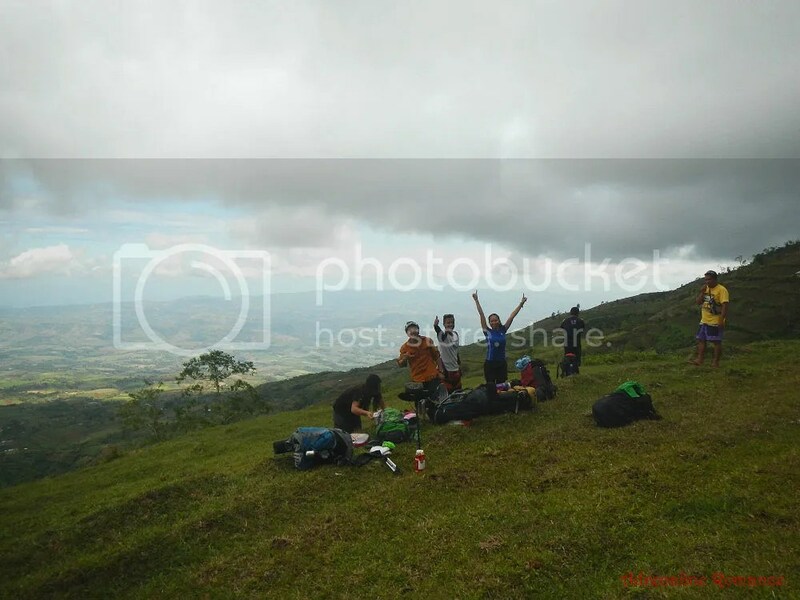 Last March 28 to 30, 2014, we climbed this beautiful mountain. This was my third time to summit Mt. 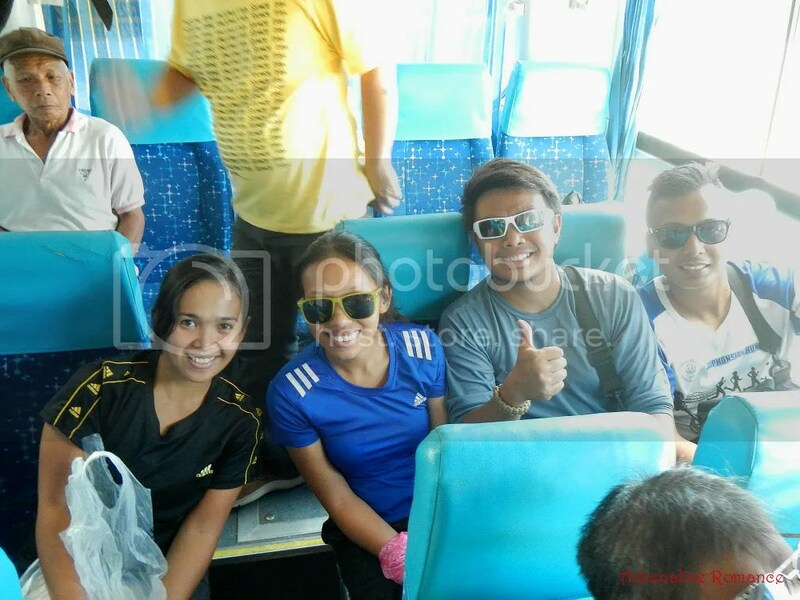 Kanlaon, but it was the first time for Sweetie and team-mates Apol Antenor, John Michael Gonzales, and Valkyrie Dumagan. We arrived at the port of Toledo very early in the morning of March 28 at daybreak, around 5:30 AM. We didn’t want to miss the first fast craft trip out of Toledo, which, according to our research, supposedly departs at 6:00 AM. Well, we came in too early because the new schedule indicates that the first fast craft trip out of Toledo to San Carlos City is at 7:30AM, not 6:00 AM! Well, it was a good thing though. The early bird gets the worm, and we got more than that. We were the first ones to get tickets, we had time to eat painit (a very light meal before breakfast) of puto maya (steamed rice cake) and sikwate (Filipino hot chocolate) and breakfast, and we had time to relax. Across Tañon Street is the majestic Mt. 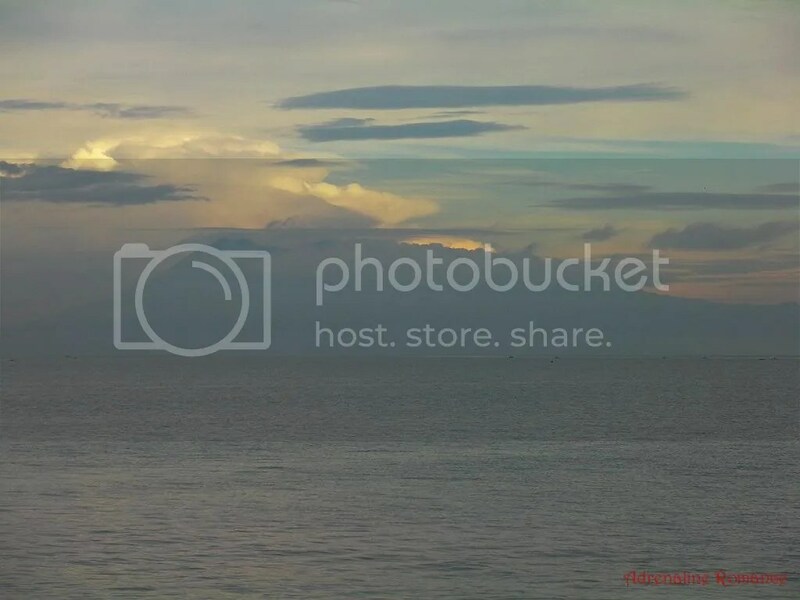 Kanlaon, which, like an everlasting god, looks over Central Visayas. At 2,435 meters above sea level, Mt. 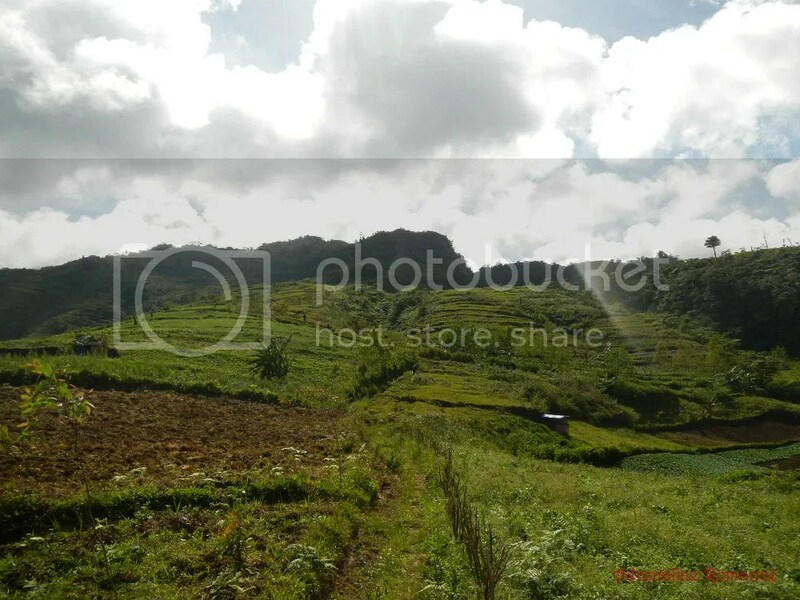 Kanlaon is the highest mountain/volcano in Central Visayas. It is also one of the most active volcanoes in the Philippines. At 7:00 AM, we boarded our fast craft. Wait, is that it? It’s pretty small; check out the photo below and use the height of the crew member as reference. Amazingly, the small, fast boat can accommodate around a hundred passengers comfortably! We were ushered to the front of the craft, which is air-conditioned and very comfortable. A good omen for the climb, we should say. 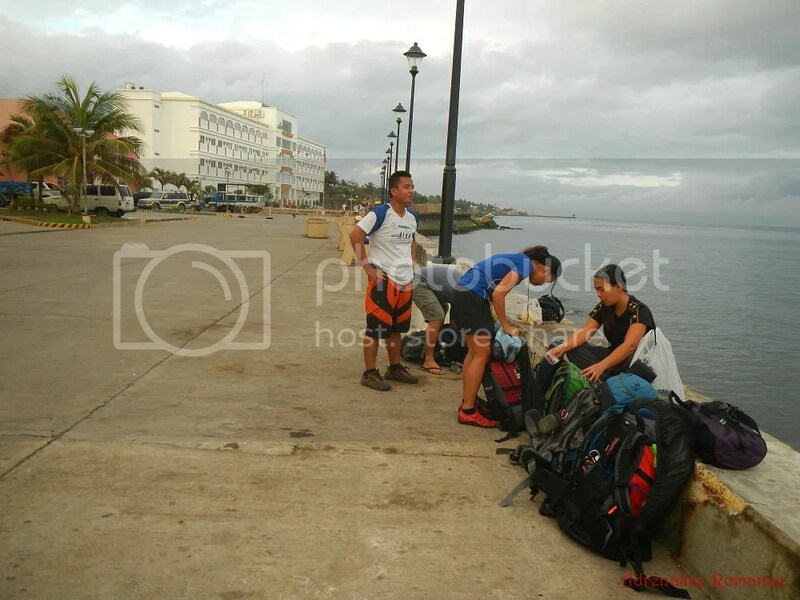 After an hour of crossing the still waters of Tañon Strait, we reached the port of San Carlos City. The adventure has started! We rode a tricycle to San Carlos City’s Bus Terminal to catch the Ceres bus to Canlaon City at the base of Mt. Kanlaon. However, when we arrived there, there were no buses to Canlaon City. 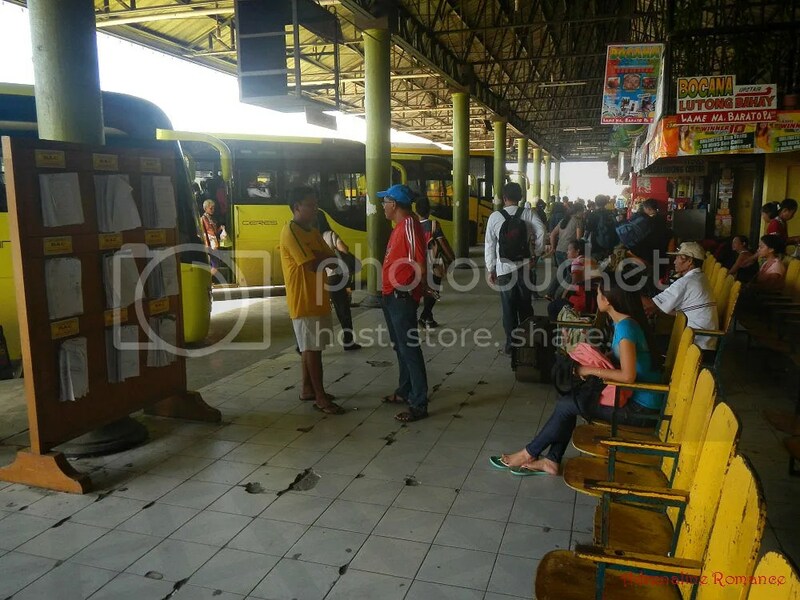 According to the vendors, drivers, conductors, and terminal staff whom we talked to, the buses that normally ply the San Carlos City-to-Canlaon City routes have problems with their franchises. As a result, the route was temporarily halted. There were still V-hires that ply the San Carlos City-to-Canlaon City route, but they take hours to fill up. There are also jeepneys (they call them Fieras) that ply the said route, but their “appearance” is sporadic. 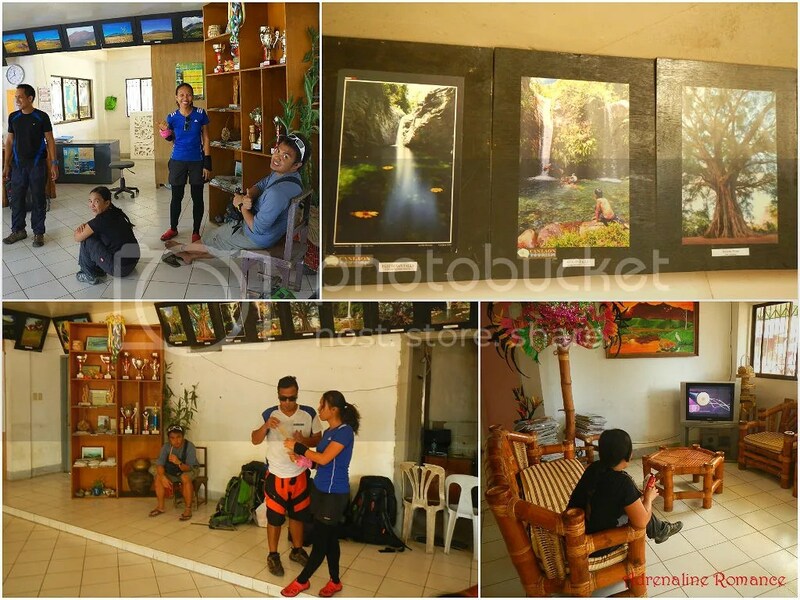 Thankfully, a few days prior to our scheduled climb, our friends Sir Joel and Sir Jigz informed us of an alternative way: a bus ride to Barangay Bagawines and, after that, another bus ride to Canlaon City. 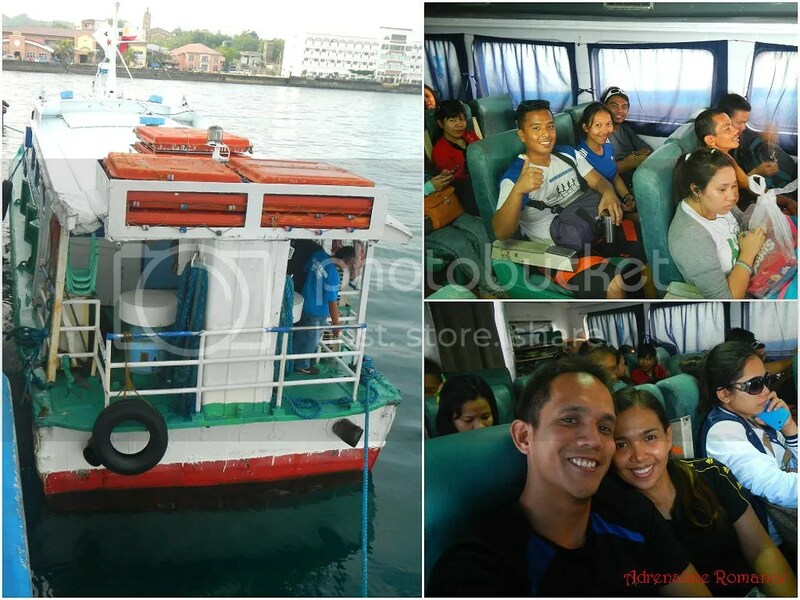 At 9:30 AM, we rode a comfortable, air-conditioned Dumaguete-bound bus that stops by Bagawines. 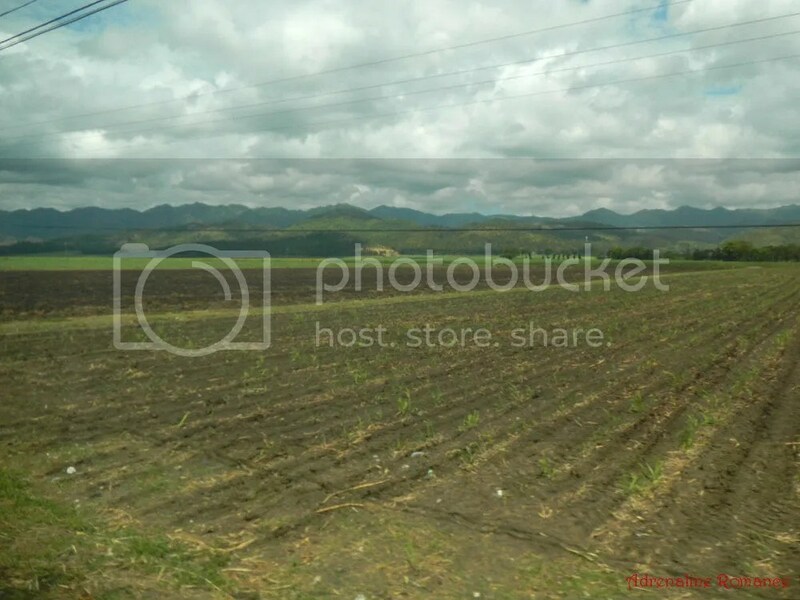 Along the way, we witnessed vast tracts of both newly harvested and newly planted farmland. Corn seems to be the crop of the season as they grow fast and can easily stand the summer heat. 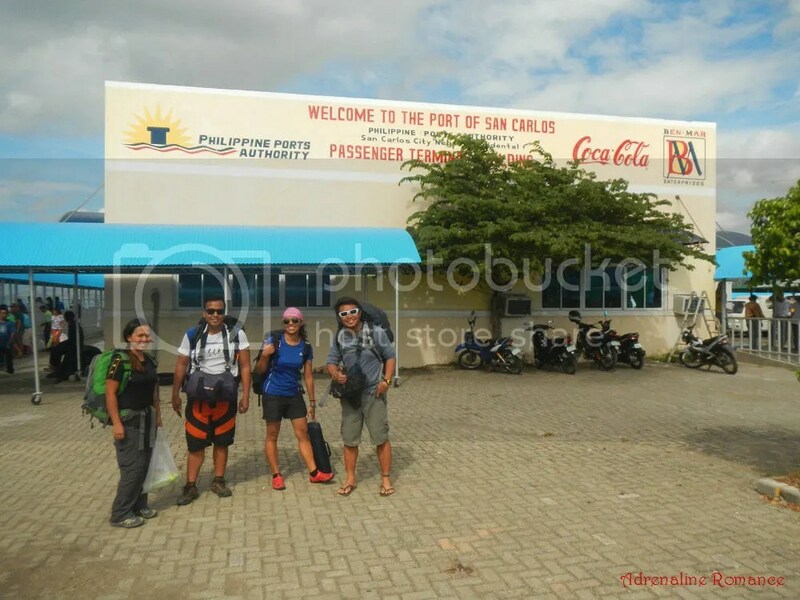 Thirty minutes later, we arrived at the crossing of Bagawines, which is the gateway to Canlaon City. As soon as we got off the bus (and perhaps seeing our large mountaineering packs), habal-habal drivers hounded over us and offered to bring us to Canlaon City. The quoted prices, we believe, are too steep—P100 to P150 per person. Fortunately, a kind tricycle driver agreed to a price of P400 (P80 per person) to bring us to Canlaon City. That was much more reasonable, but the best thing was that we were able to ride in comfort and safety in his big tricycle. 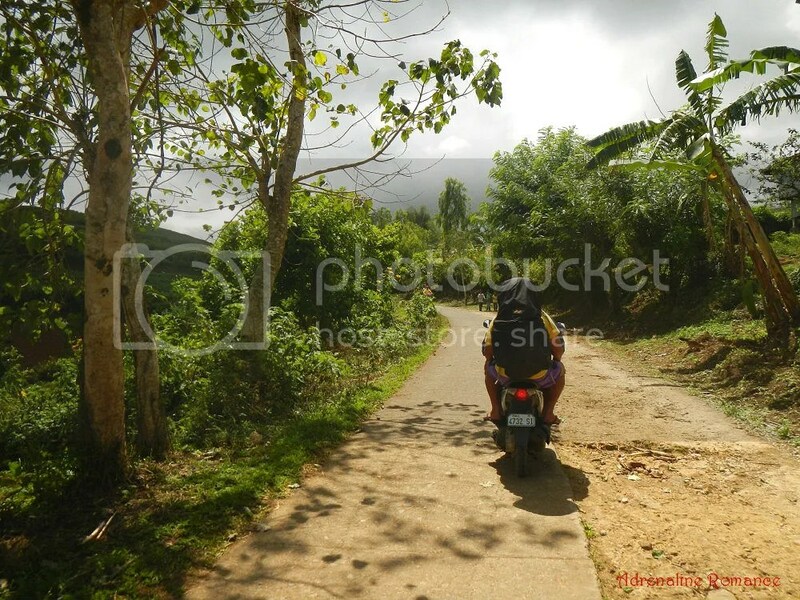 The long ride to Canlaon City was quite pleasant although we secretly pitied our vehicle. 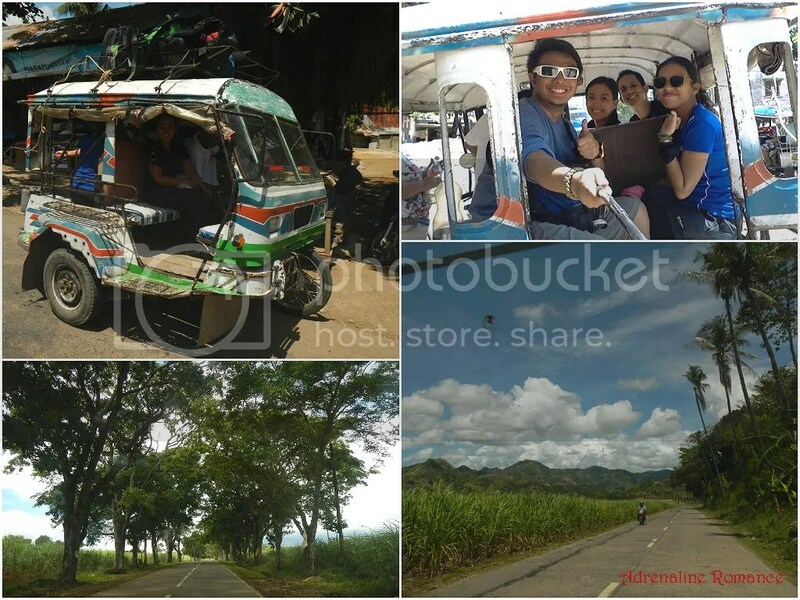 The tricycle had to groan and strain to climb the hilly slopes, but we were treated with breathtaking views along the way. We arrived at Canlaon City at exactly 11:30 AM. It was such a surprise; we were walking towards the Canlaon Tourism Office when we spotted the friendly tourism office staff waved at us. It turned out that our contacts—Sir Jigz and Sir Laddie—had already arranged everything for this expedition, from transportation, accommodation, and elements of the climb itself! 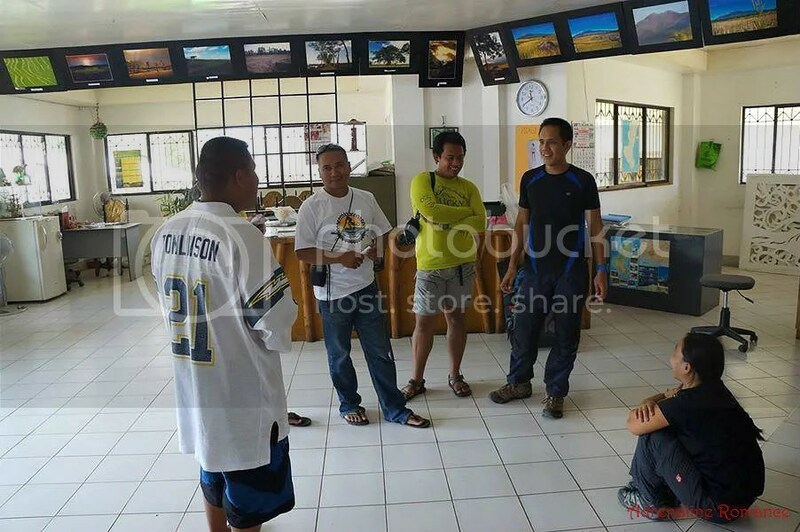 We quickly introduced ourselves and had a short briefing with Sir Laddie, lead guide; Sir Steve Bolivar of the elite Canlaon Mountain Tigers Search and Rescue organization; and Sir Eduardo “TBong” Alipar, Mt. Kanlaon guide at the tourism office. That’s our duly signed, fully completed climbing permit! Since Mt. 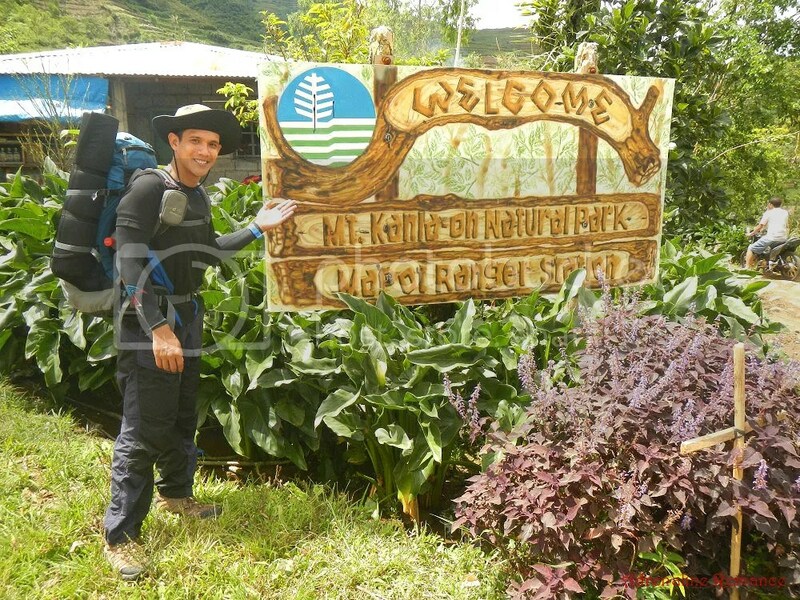 Kanlaon sits in a protected natural park, it is actually illegal to climb Mt. Kanlaon without this officially issued climbing permit. An excellent climb always starts with excellent food! 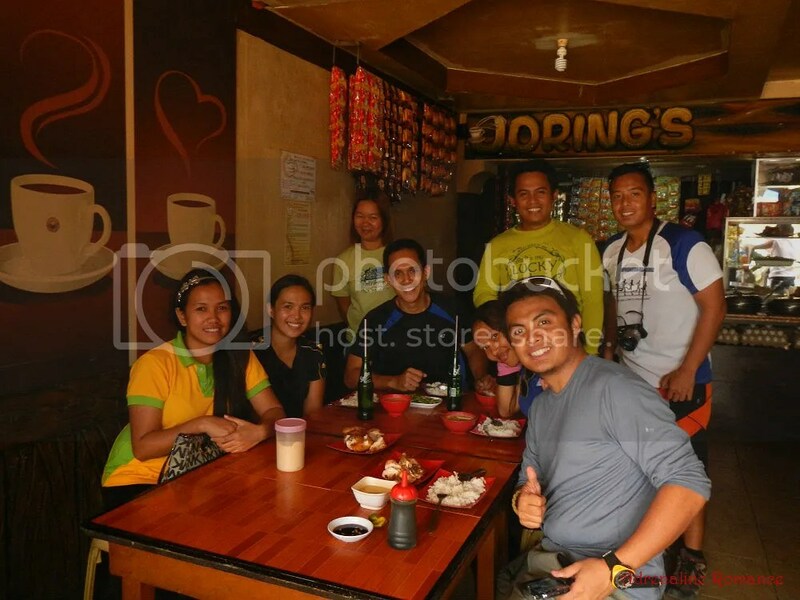 We devoured a sumptuous lunch at the nearby, quaint Joring’s Café with our good friend Sir Jigz Santiago, former Mt. 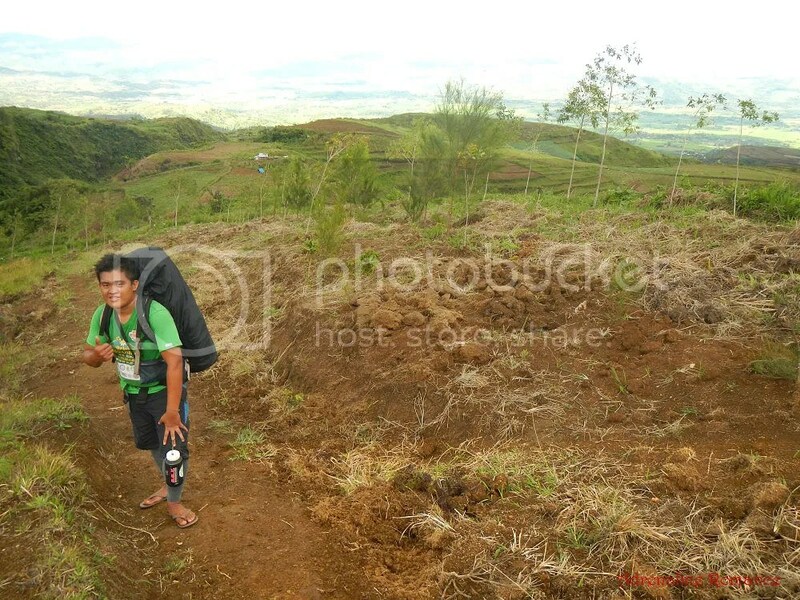 Kanlaon head guide and now a kagawad. His partner, April Marcial, a DepEd teacher, joined us a bit later. After a filling lunch, we headed back to the Tourism Office to answer the call of nature, rest, and do last-minute preparations. Sweetie took time to watch a particularly interesting segment of a noontime show while I busied myself looking at photos of other attractions in Canlaon City that are worth a visit. At exactly 1:00 PM, with the sun up high and searing the land, we were geared up and ready to undertake this year’s first major climb. 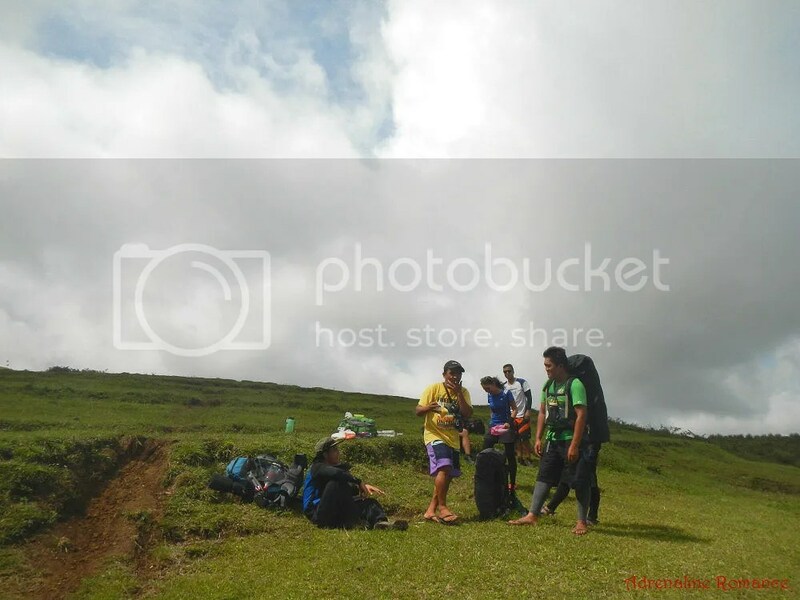 The guy in yellow shirt with the Habagat cap is Sir TBong, a highly skilled mountain guide assigned to us. Habal-habals, which have been previously arranged for us by the tourism office, took us to our jump-off point in the farmlands of Barangay Mapot at the foot of the mountain. It was a good thing that the road was paved and smoothed; a few years ago during my first climb up Mt. Kanlaon, the road to Mapot was terrible. 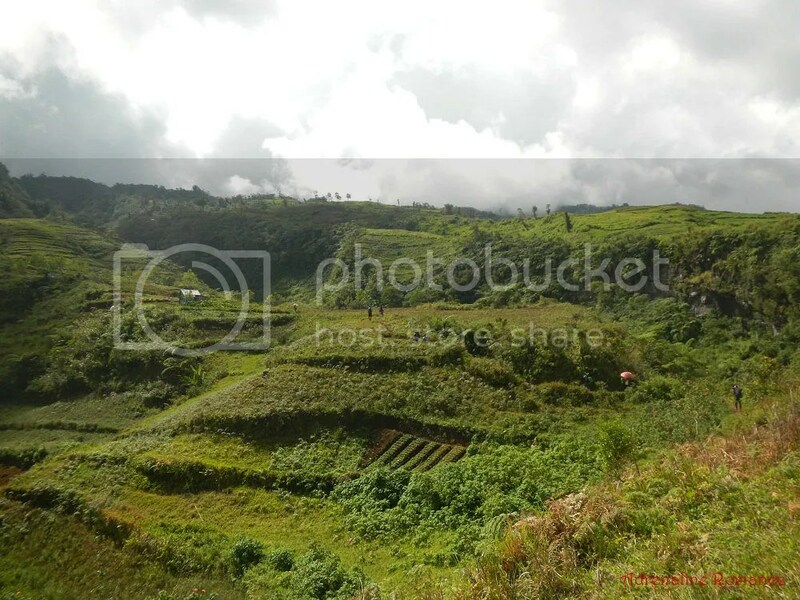 Huge expanses of rice terraces dominate the plain before a cloud-covered Mt. Kanlaon. Welcome to Mapot Ranger Station, the standard jump-off point for most climbs up Mt. Kanlaon from Canlaon City. We reached the jump-off after 45 minutes of a comfortable ride on a habal-habal. At the jump-off point, two other guides, Sir King Besario who wanted to climb with us after staying for some time in Manila, and Sir Arly Avila, a guide in training, joined us. As usual, we had a last-minute briefing and mumbled a short prayer for safety. Then it was time to climb Mt. Kanlaon! From the very start, the Mapot trail involves a gentle but grueling, nonstop ascent towards the base camp, which is located a few kilometers away. We climbed on soft, mineral-rich soil that was part of a network of farm trails. Compounding the ascent was the fact that it was a very hot, humid, sweltering afternoon, and there was no shade available on the trail. In just fifteen minutes, we were high above our jump-off point, which is a bit right beside that house with the green roof. 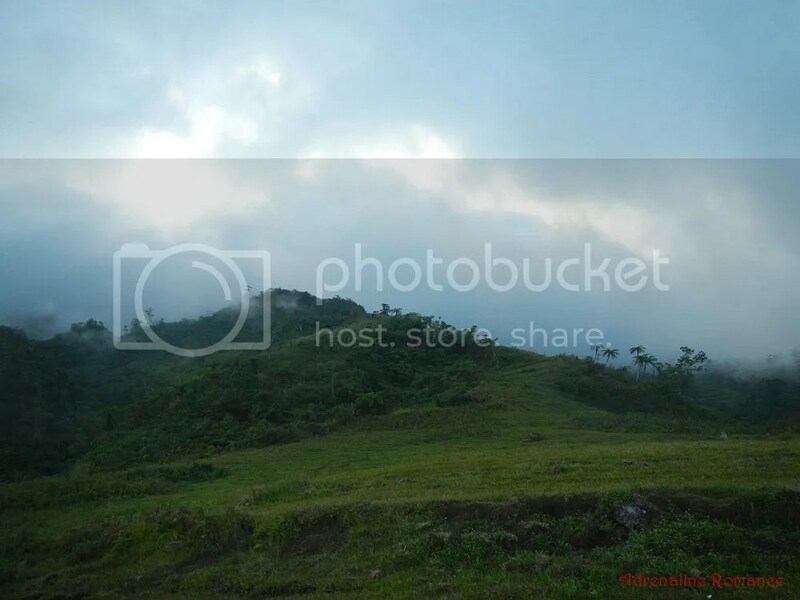 One of the most prominent features that can be seen is the Bao-bao hill, so named because it is shaped like a turtle’s shell; the English translation for bao is “turtle.” Sir Tbong said that decades ago, Bao-bao was covered with first-growth forest. As years went by, farm fields encroached the hill. 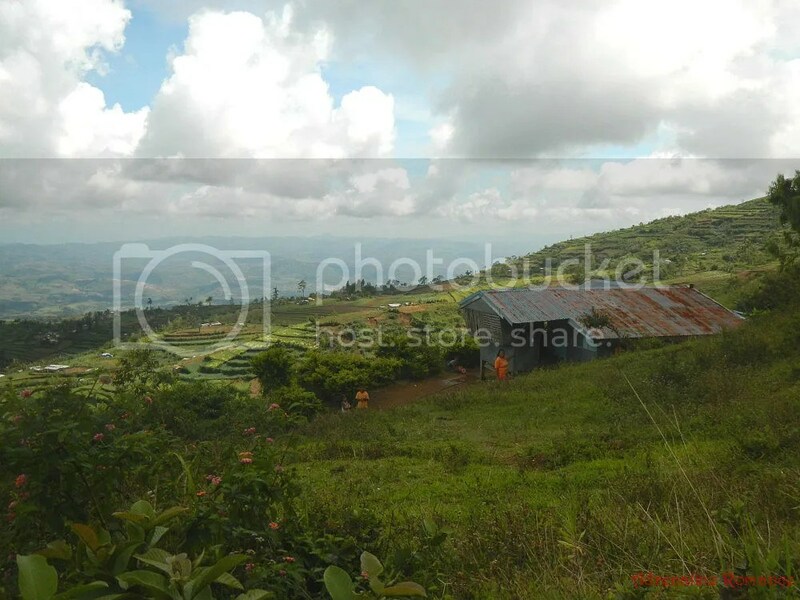 The climb was tiresome, but it was also a great opportunity for us to experience snippets of farm life, an important component of which is the small population of very friendly residents. For example, as we passed by this house, the lady of the house (the woman in orange) warmly invited us for a cup of hot sikwate even though she didn’t know us from Adam! Talk about the world-renowned Filipino values of warmth and hospitality! Of course, we politely declined. 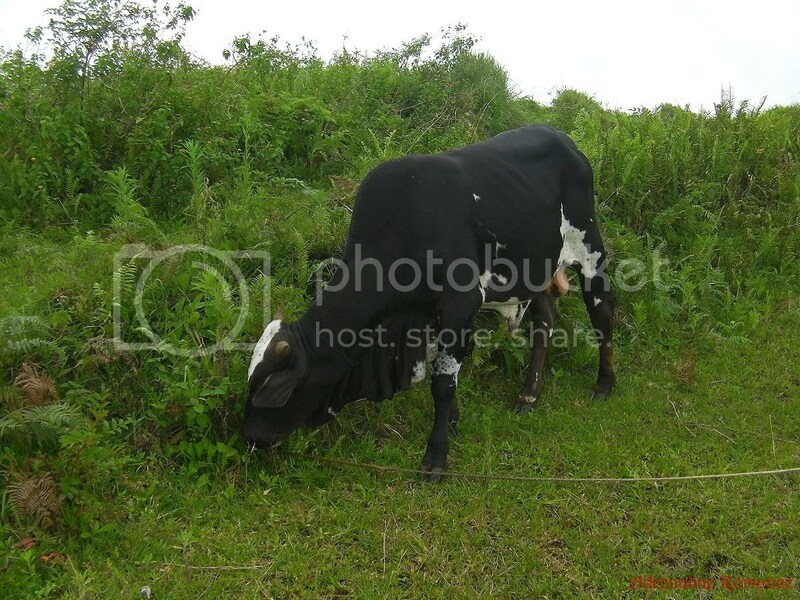 Cows freely roam around the fields; this one was blocking the trail before I took the photo. 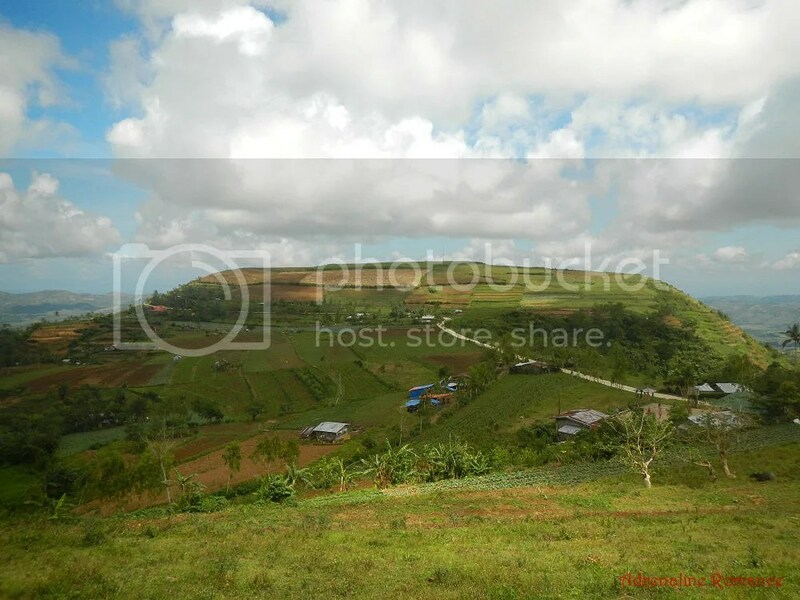 Farm terraces are prominent at the hills and slopes around the lower part of Mt. Kanlaon. Terracing is a technique wherein a series of successively receding platforms or flat surfaces are cut into an inclined piece of land, such as the slope of a hill or mountain. Resembling giant steps, terraces decrease erosion, lessen surface runoff, support crops that require irrigation, and permit more effective farming. As you can see from the vantage point of the photo below, the inclined trail is unending and merciless. We sweated, grunted, and panted as we struggled to combat heat, exhaustion, and sore legs while carrying a full load of food, supplies, and camping equipment behind our backs. Whew! A 15-minute rest on top of a hill can be a huge surge of relief! I think everyone shared the same sentiment; we were absolutely grateful and happy for the short break. Sir TBong offered slices of fresh pineapples so we can regain our physical body’s energy. That’s the beautiful vista from our resting place! Amazing! While the sweet pineapples and cool water replenished our energies, knowing that we were inching slowly towards the clouds filled our spirits with hope and serenity. Before long, the break was over, and we felt a new flow of energy as our bodies adjusted to the climbing conditions. We walked a little faster, stronger, longer. We crested higher hills. Terraces and manicured farms became fewer and cruder; signs of agriculture gradually faded as we approached the mountain’s treeline. We passed by the last house before our base camp and the treeline. 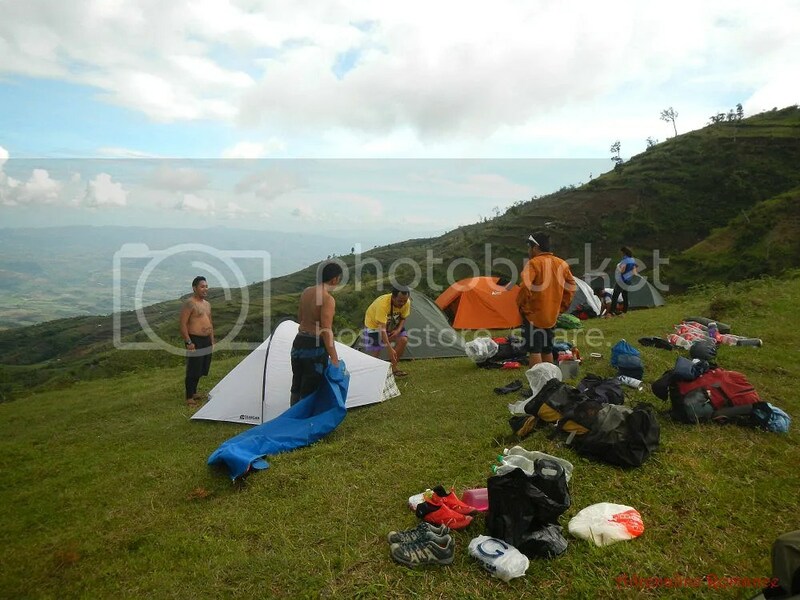 During my first climb here, we camped at a flat, grassy field beside the house. 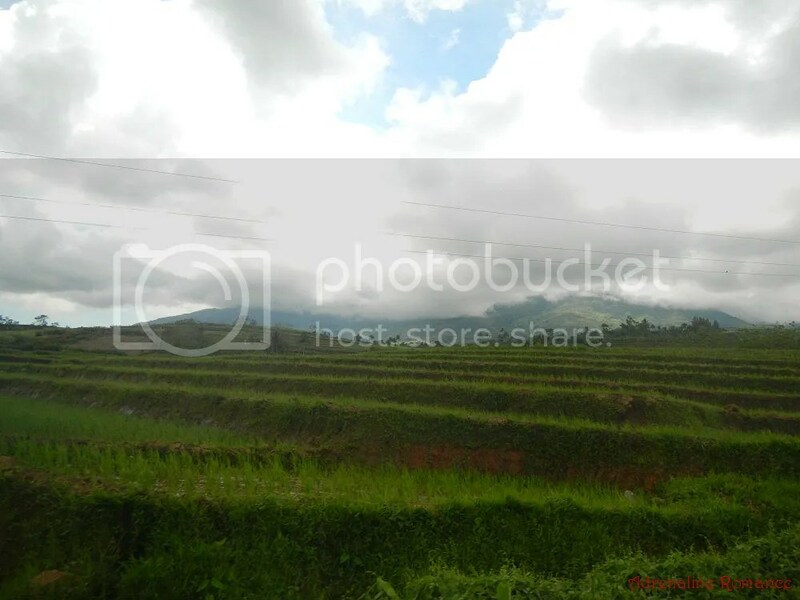 This time, however, that field was tilled and planted with crops, prompting Mt. Kanlaon guides to move the base camp higher. 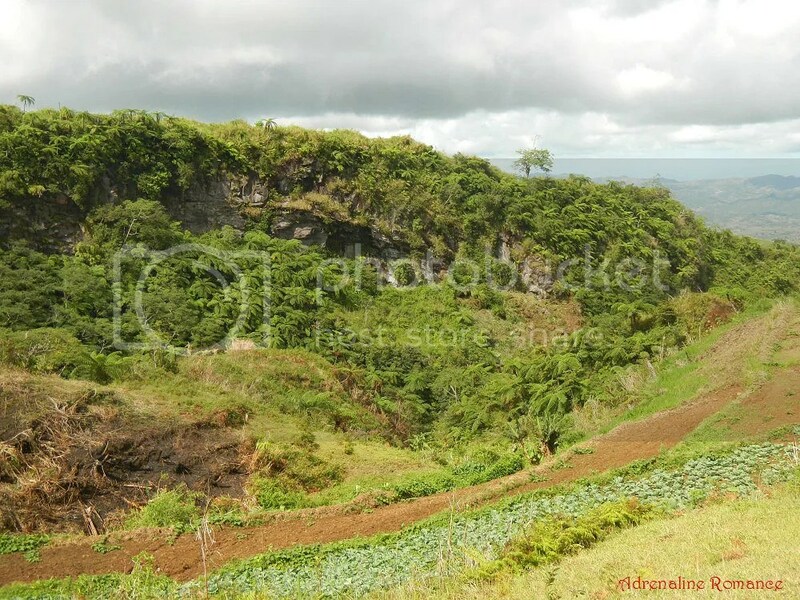 That’s a beautiful, unspoiled limestone cliff right beyond the edge of the farmlands. Bouldering, anyone? Beyond that hill is our base camp. 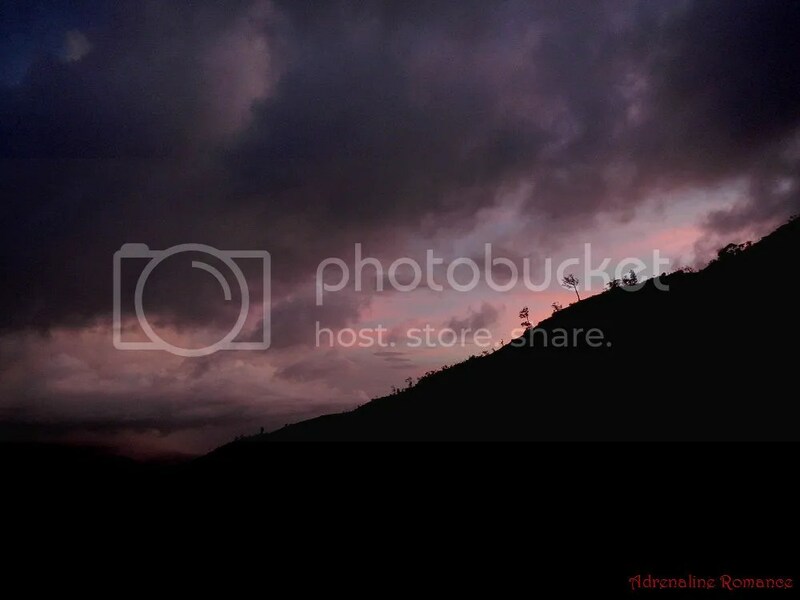 Check out the photo below; you can see that the treeline is quite near. 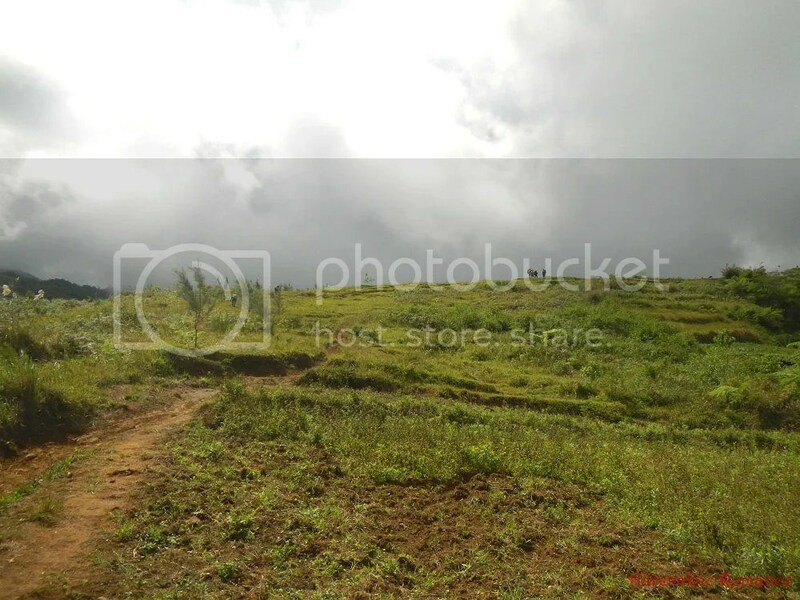 That’s a really muddy trail that we had to walk on before reaching the Mapot base camp. 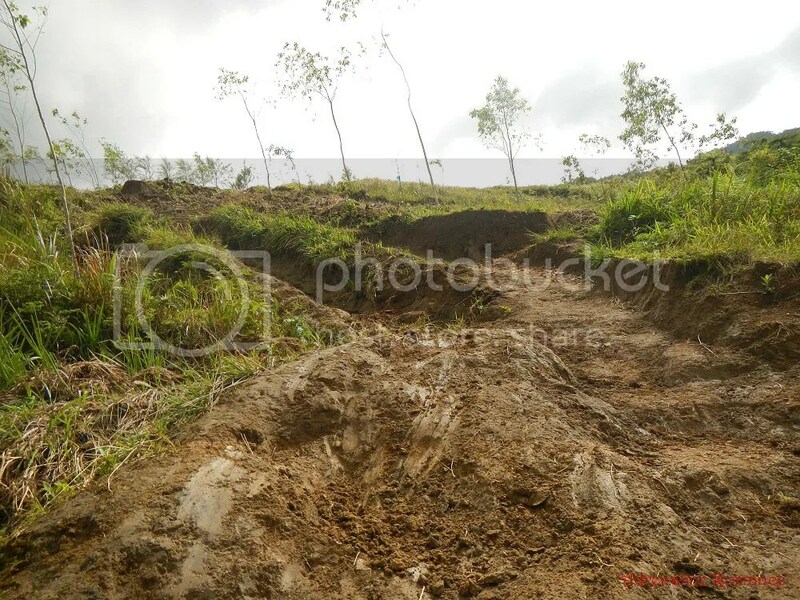 Look at the photo below; you can just imagine the thickness of the mud and how difficult it is to walk on that trail during rainy season. Good thing we planned this climb during the hot, dry, summer season. See those thin trees beside and behind Sir Arly? Sir Arly explained that they replanted these trees to hopefully grow a second-generation forest. 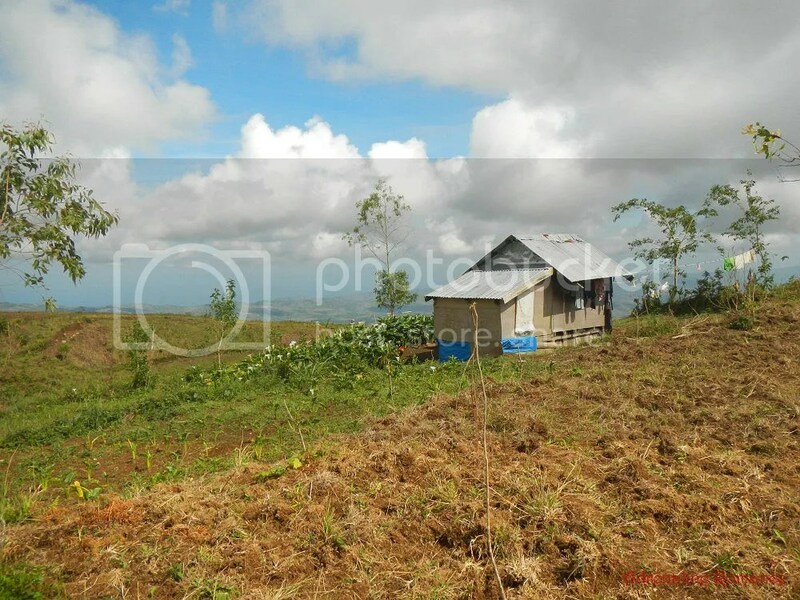 Agricultural encroachment has moved the treeline farther up the mountain, worrying the Canlaon Tourism Office. Concerned with the environmental damage, the Office worked with the Department of Energy and Natural Resource to plant new trees in an attempt to halt—or possibly reverse—human encroachment. After three hours of a merciless, grueling climb, we finally reached the Mapot base camp! Congratulations! At last, we can now have a well-deserved sound rest after a sleepless night and a tough climb. After a short rest, we assembled our tents and set up camp. That’s our camp. 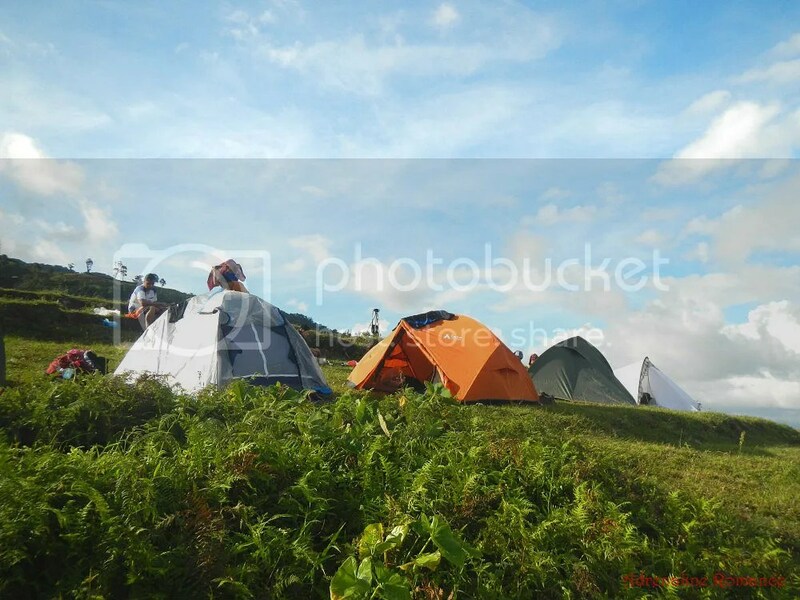 This is actually an almost perfect camp: the grassy ground is almost level, and there is a water source nearby where we can get fresh, potable water. 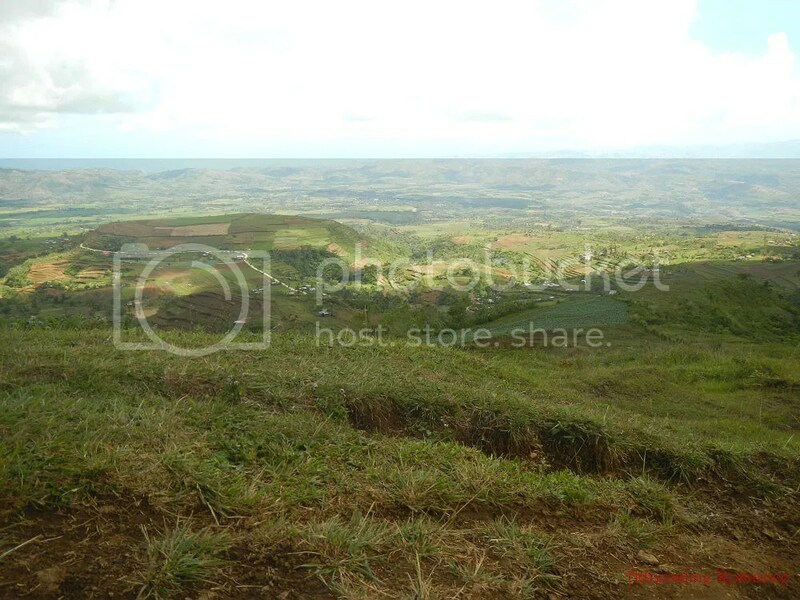 The surrounding verdant mountain protected us from high winds while in front of us is a spectacular view of the lowlands. Speaking of the view, just check out that astonishing vista! Way below us are checkered fields, specs of human establishments, distant hills and mountains, and the serene Tañon Strait. Being treated to vistas like this is rare, and the opportunity should be treasured. While there was still light available, we set up our equipment and ingredients so we can cook our dinner and turn in early. Everyone was busy preparing something! Mmmm! Things definitely smelled great here as aromas of fried garlic and onions filled the air. The sizzle of something being pan-fried and the pleasant sound of bubbling boiling water made us squirt saliva in our mouths. Want to know our contribution to dinner? 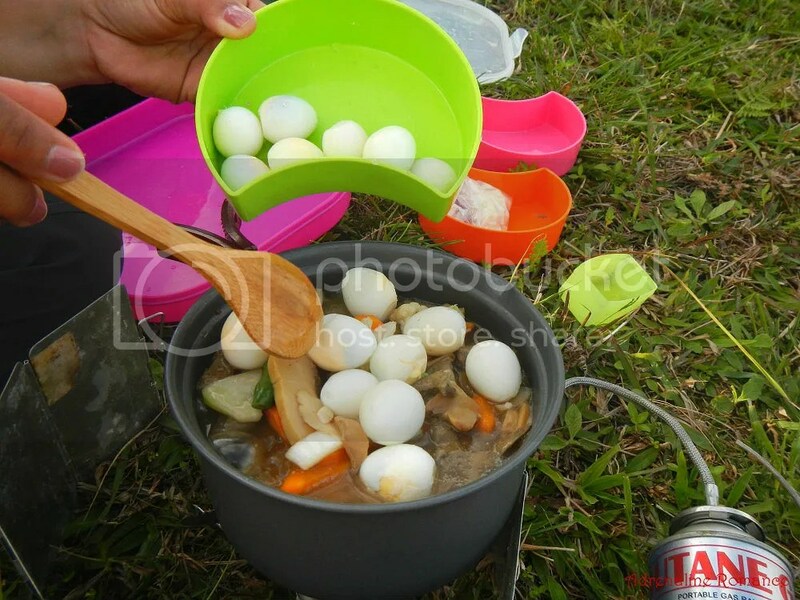 It’s Sweetie’s own yummy version of chopsuey with quail eggs. An hour later, dinner was ready. Check out that feast! That’s our chopsuey; John, Apol, and Val’s Bicol Express; and the guides’ spicy noodle soup and tinap-anan (smoked fish). For dessert, Sweetie brought mango float. 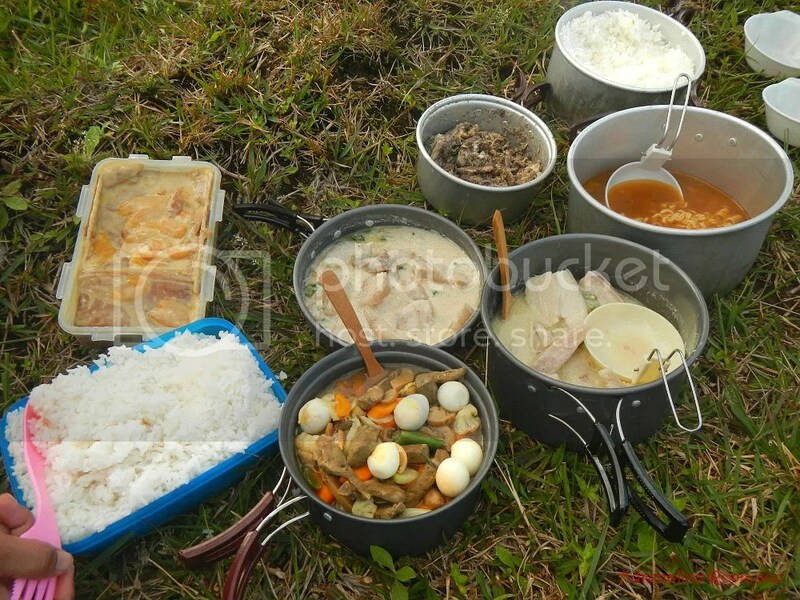 Who said that mountain meals are limited to bland and boring canned goods, and ready-to-eat or ready-to-cook meals? With a little planning, we can prepare a feast out there! Dinnertime! Attack! Sir Tbong and the rest of the guides could only shake their heads in amazement. They later gleefully remarked that this was not a normal “mountain meal.” It’s a fiesta out here! They laughed as they realized why our bags were heavy; they were filled with ingredients for sumptuous meals! 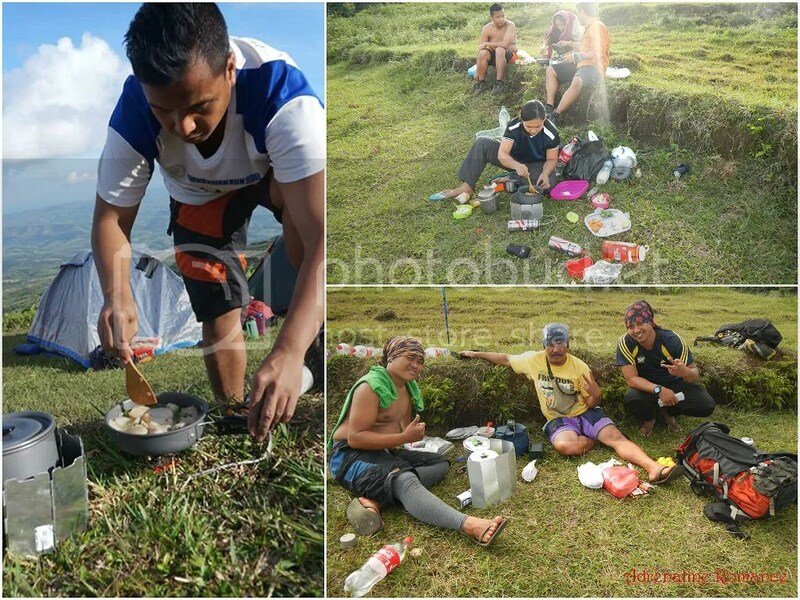 We brought and prepared excellent food, which definitely increases morale, energy, and positive feelings during an arduous climb. It was a good thing we had our dinner early. By 5:00 PM, a thick fog started rolling in the campsite. The light got dimmer as the sun started to say goodbye. The temperature rapidly dropped, and the air became uncomfortably cold. At around 5:30 PM, Val announced that the air around us was 18 degrees Celsius and still dropping. Everyone changed into cold-weather gear to ward off the biting chill. Goodbye, sun, and thank you for being good to us today. It was time for a good night’s sleep. We have completed the arduous first leg of our first major climb this year, and it was definitely fun! Everything was readily arranged for us, we were part of a strong team, and we were in the hands of the best guides. We started the climb right, and we were definitely excited for the morrow. Trek to Part 2 of this adventure. The itinerary, budget, and other important information about the climb proper are in subsequent posts. What we will put here in our Tips section is information to complete the most crucial elements of the adventure, the filing and processing of your climbing permits. 1. Before climbing Mt. Kanlaon, you need to secure a climbing permit. The official permit consists of three documents: 1) an individual’s climbing permit, 2) a group permit, and 3) a waiver. We have copies of these documents, so Contact Us or send us an email at adrenalineromance@gmail.com so we can send them to you electronically. Print them out and fill them completely. Important! Do not forget to include your contact details. The Canlaon Tourism Office will regularly update you of the status of your permit, and they won’t be able to do so if you don’t put your contact details. 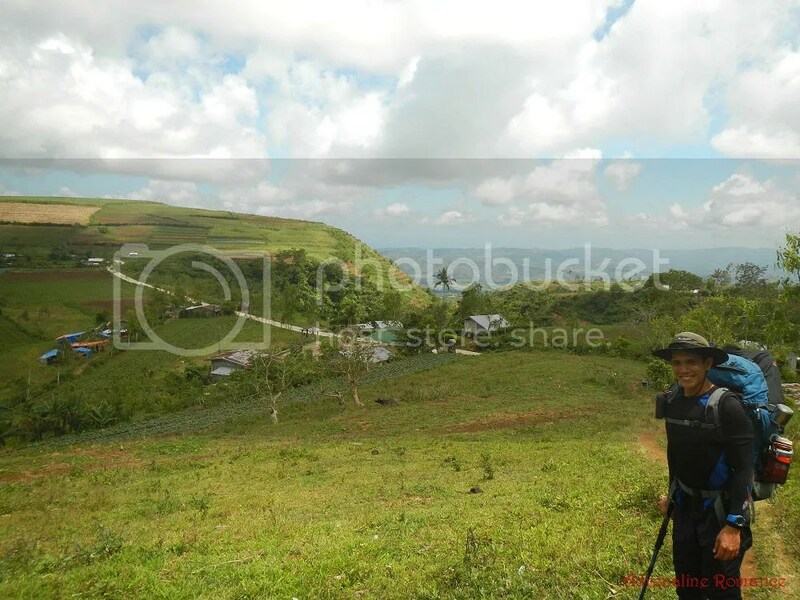 During this climb, we took the Mapot-Mananawin trail, with Mapot as our entry point and Mananawin as our exit point. Contact the Canlaon Tourism Office for more information and advice about the mountain’s trails. 4. The most important document in this set is the waiver, which you need to have notarized. Ensure that each team member’s waiver sheets are stamped and notarized by a licensed lawyer before you send them to Canlaon City’s Tourism Office. The Office won’t process your permit without the notarized permits. 6. Please find below the necessary fees you need to pay. Except for the processing fee, all permit fees should be paid individually. 7. For your payment, go to a Palawan Pera Padala branch near you. Send your payment for permits and processing fee to Mr. Laddie Lamis (0928-6384322). 8. Many climbers line up for a slot to climb this glorious mountain. To ensure your team’s slot, it is best to send and have your permits processed at least a month before your actual climb schedule. In case your climb is cancelled due to uncontrollable circumstances such as bad weather, natural disasters, administrative orders, etc., your permit is still valid for 1 month. Thus, your climb can be rescheduled; just contact the Canlaon Tourism Office for rescheduling. 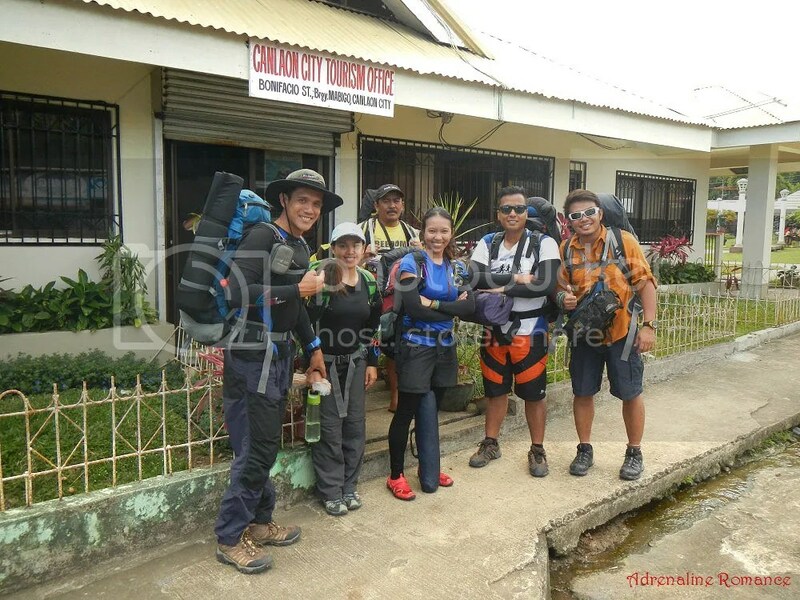 The Canlaon Tourism Office will contact you in case of a mandatory cancellation of a climb. Note, however, that the 1-month validity does not apply for voluntary cancellation. For instance, if you cancel your confirmed climb because some of your friends backed out, you cannot avail of the 1-month validity. You need to re-apply for a new permit even if your new schedule is well within 1 month from your cancelled schedule. 8. For guide and porter fees, please check the information below. 9. 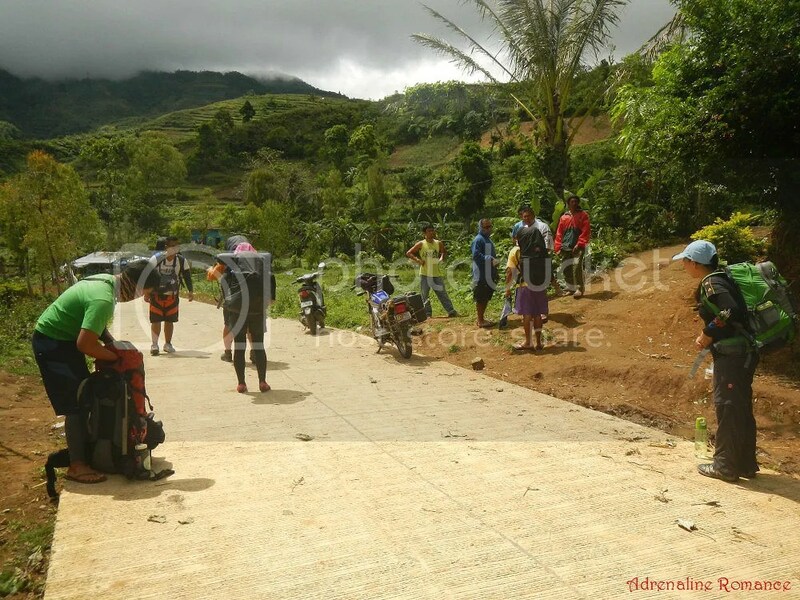 To preserve the trails and to avoid overcrowding the mountain, strict measures as to how many people at a time can use any single trail are implemented by the Canlaon City Office. Thus, expect a split-up of team members if you belong to a large group. 10. For safety and security of your team (especially if it’s a large one), the Office will require a number of skilled guides and/or porters to accompany you on the mountain. That very beautiful day is still fresh in my mind. A vibrant team of climbers, cool guides, smooth arrangements and coordination, perfect weather and sumptuous food; it truly was a perfect first day for a memorable climb to Mt. Kanlaon! Thank you so much for reading! Part 2 is in the making and will be posted really soon. Stay tuned! This is an awesome write up about a very awesome adventure. Congrats and thank you Sir Gian and Ate Sheila for letting us share this with you! The whole experience was certainly extra-ordinary and unforgettable. Yes, Ate Sheila, the 360 degrees picture-perfect views from the peak, truly awesome! Thank you! We’re glad to know that even though you were not physically there with us, we were able to take you to a great journey through our blog post. The trail does need a few trees, especially at the first few kilometers of the Mapot trail. However, right after the base camp; the treeline begins and the forest is still pretty thick. Firewood is not really a problem; the mountain is perennially wet. And most of the settlers there have modern cooking conveniences such as gas stoves. The real problem is agricultural encroachment. Even if the area is declared protected, farms are slowly eating up the forest, pushing the treeline farther up the mountain. 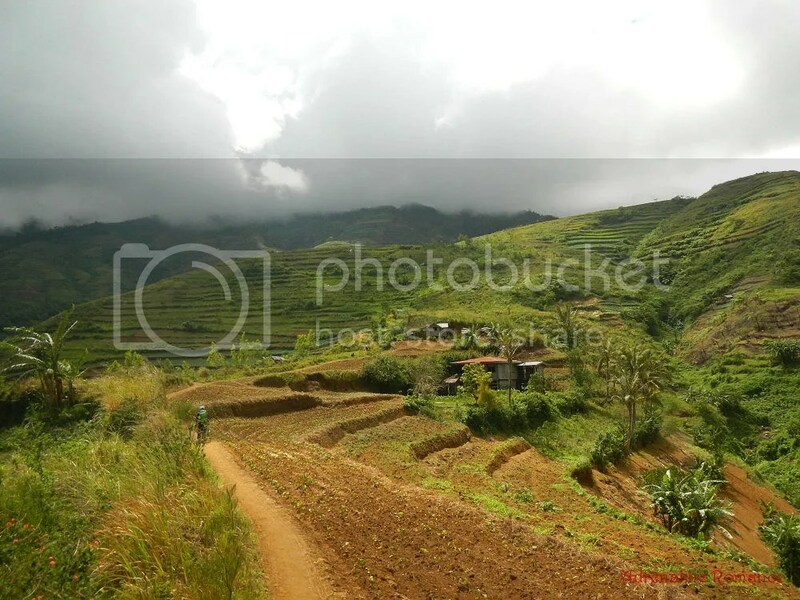 Although we are sure that the encroachment won’t push the forest even midway up the mountain, Canlaon’s Tourism Office, LGU, and DENR should make prudent efforts to educate farmers about sustainable farming and environmental protection. I totally agree with you. Denuded forests are environmental disasters. I won’t discuss about repercussions but let us hope for the best, hope that the powers that be will do the right thing and protect what’s left of beautiful Mt. Kanlaon. hi. i have a ticket to dumaguete next month and wish to climb this glorious mountain. lalo akong na excite after reading your blog. the pictures of nature are awesome and the food, was truly gatronomical! ang sarap nyo siguro kasama, for that reason, among others, hahaha! i notice or baka malabo lang mata ko, i did not read/see the tourism office’s email address? 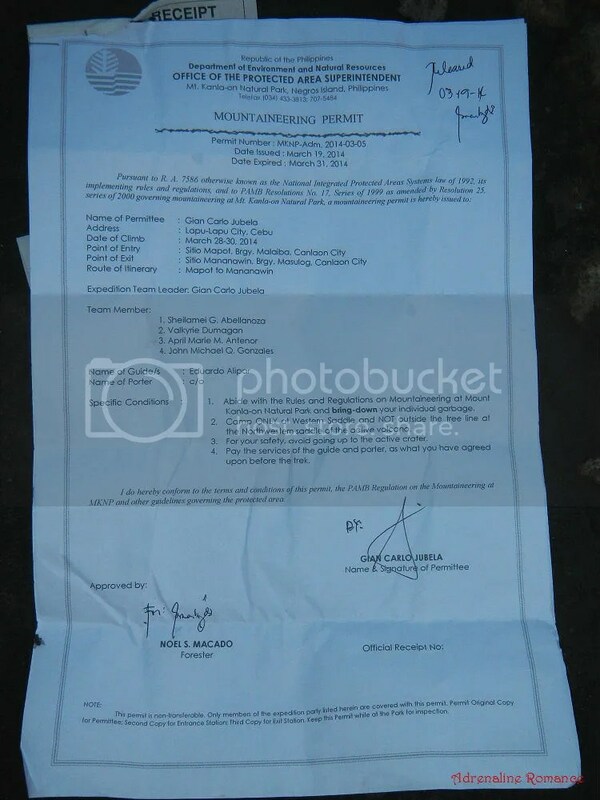 san dapat ipa notarized ung waiver, dito sa kin or pwede na dun sa office nila? what do you think is the easiest trail? 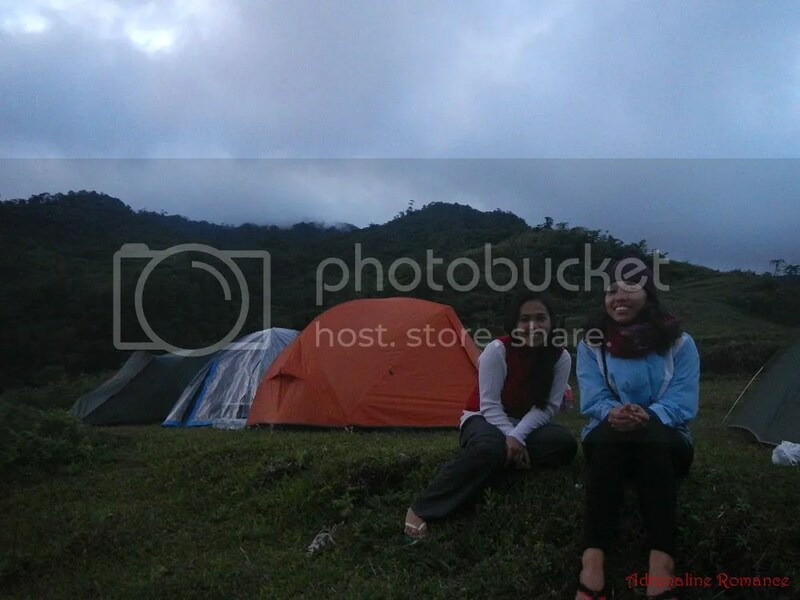 We’re very happy to know that our blog about our Mt. Kanlaon climb inspired you. We can truly say that the mountain is one of the country’s most precious eco-tourism, adventuring, hiking, and mountaineering gems. Hehehe! We’re sticklers for good food! We believe that great food tastes even better up there in the wilderness. 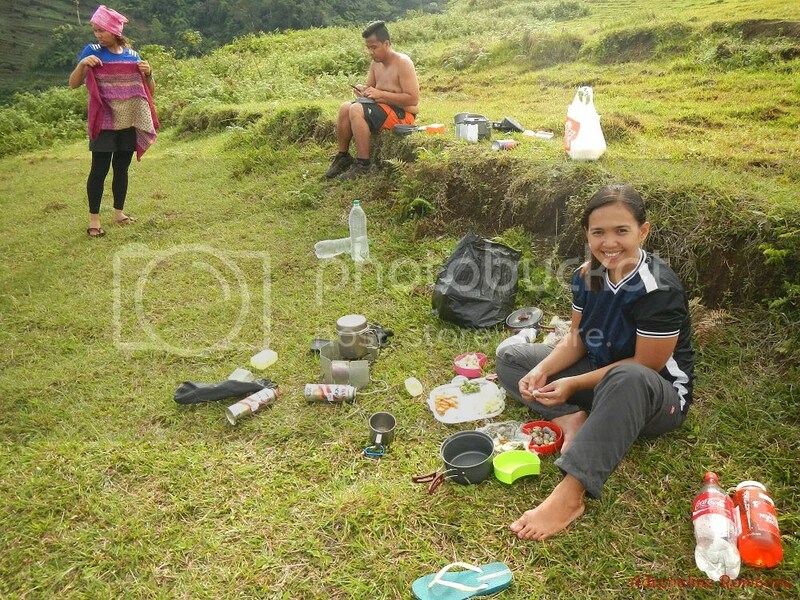 It would be a waste if we didn’t bring great food each time we climb. 1) Unfortunately, we don’t have info on Canlaon City Tourism Office’s e-mail address. That is one thing we overlooked. Now that you mentioned it, we are getting in touch with our contacts there so we can obtain their email address. In the meantime, use the contact details in this post; specifically, send a text message or call Sir Laddie Lamis for inquiries and information. 2. To process your permit, the Office needs a notarized waiver, so have your waiver notarized at your end and send it along with your permits BEFORE you go to Canlaon City. You will save yourself a headache if you accomplish the permit processing BEFORE actually going to Canlaon City. 3. There are four official trails in Mt. Kanlaon as described above. Each has its own features and challenges, so we can’t really say which is the easiest or which is the most difficult. In this climb, since we entered through Canlaon City, we took the Mapot trail, which consists of a steep ascent through forested areas. 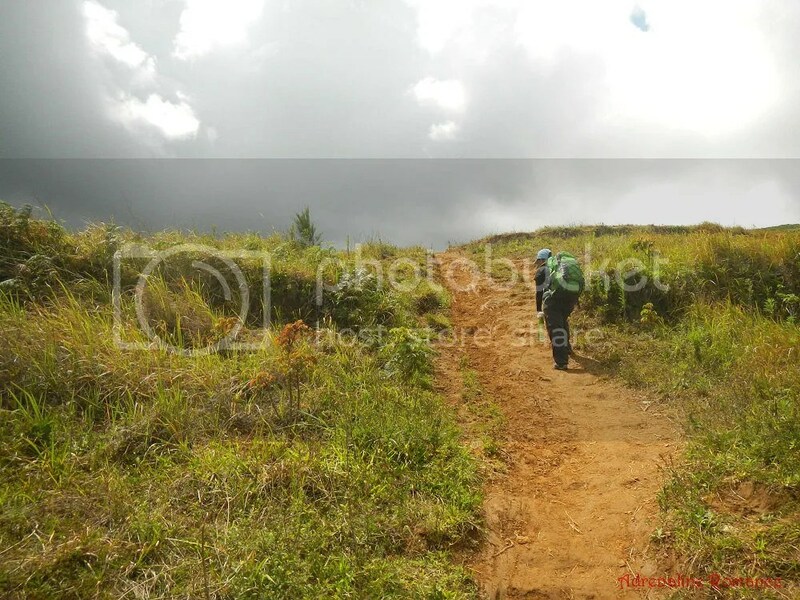 We exited the mountain via Mananawin trail, which consists of a long, knee-busting downhill trek on exposed grasslands. You can follow our itinerary or do the reverse (i.e. climbing Mananawin and exiting through Mapot). The other two trails are in the Occidental side, which entails a long traverse if you’re starting from Canlaon City. Absolutely inspiring and informative! Reading this almost felt like being part of the adventure 🙂 Thank you! We are planning to climb this great mountain this September – May God keep us safe and bless us with balmy weather! Thank you for the kind and complimentary words. Readers like you inspire us to visit more of the Philippines’ wonders and take on more exciting adventures. September is still rainy season with periodical clearing. 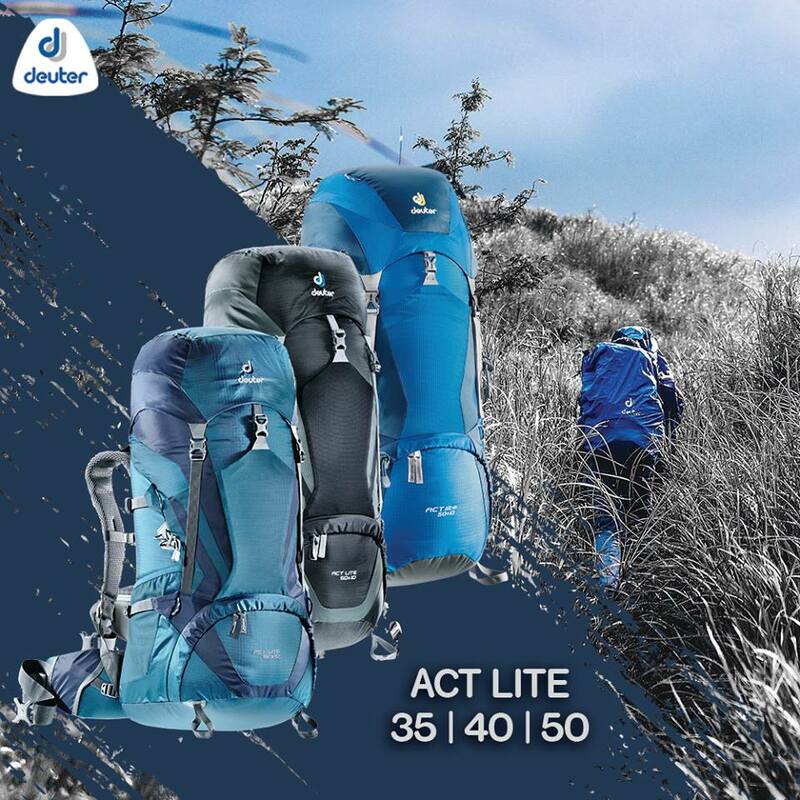 If you have the capability, please do check the weather during that month so you can have a safe climb and you will be rewarded with a clear view of the crater and Margaha Valley. They can be viewed on flat land. To get to the mountain, check out Parts 2 and 3 of this series where we placed the itinerary, budget, and tips. Thank you for the helpful tips.. 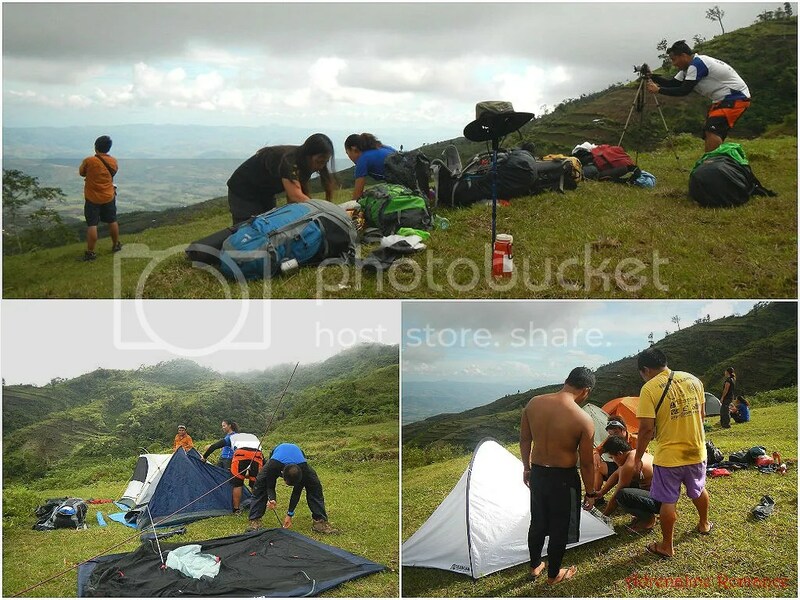 Climb in another trail check the clmbingevent at https://outdoorislife.com/event/mount-kanlaon-awesam-adventures-march-2018/ to join the once in a lifetime mountaineering experience. Thank you, Rovi! 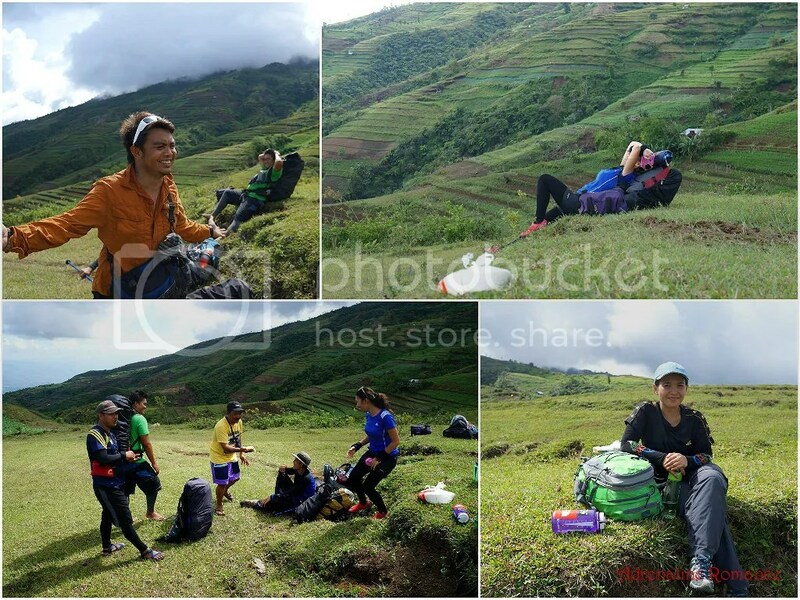 🙂 We have already traversed this mountain, starting from Mananawin and exiting in Wasay….a 4-day, 3-night adventure across Mt. Kanlaon. Beautiful site…….Wonderful post really informative one keep posting.